I remember being pregnant and not having a clue where to start when it came to the baby 'stuff' (besides the big items of course). Being the first one of my friends to expect a child, a million miles away from my family and friends, these newborn essentials blog posts and pins were really helpful. But I also remember feeling a little overwhelmed and intimidated by all these lists, trying to decide whether a pricey item was overhyped or indeed a must-have. Now that my little prince is 4.5 months old, I have had some time to reflect on the baby things I could not do without. 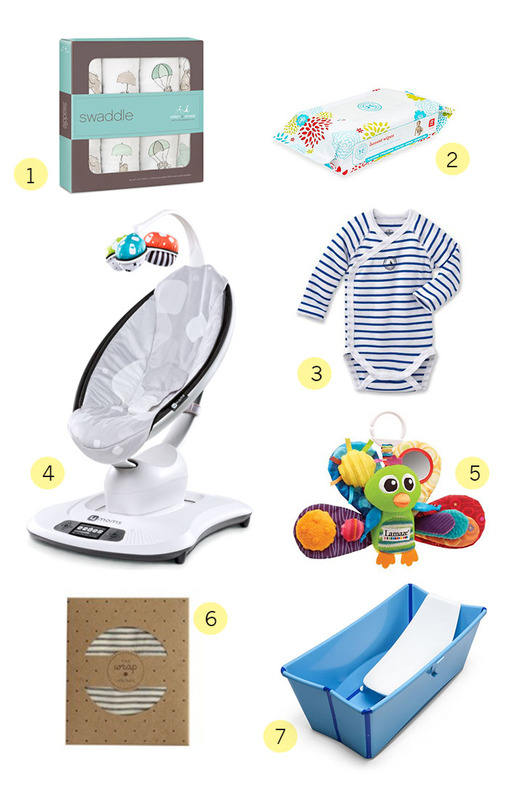 I could have included a lot more, but because most of us do not have an unlimited amount of space or money, here are the few items I would recommend to any mama-to-be. 1. Aden + Anais swaddles⎹ My husband and I chose not to swaddle our son, but these soft muslin blankets are so useful nonetheless. We have a ton and use them for everything. They are very breathable and get softer with each wash. The Up Up & Away print is my favorite, but there are so many to choose from. 2. Honest wipes⎹ I am very careful to use gentle products on my baby's skin, and tend to go for products that are free of scents, harsh chemicals, parabens, phthalates, etc. But even if that is not a concern for you, these wipes are the best! Thick and non-greasy, they don't irritate my baby's sensitive skin. 3. Onesises that open in the front⎹ I cannot stress this one enough. When you are trying to dress your tiny, fragile newborn, these are a lifesaver. I hated having to pull anything over his head more than necessary. I love the Petit Bateau onesies and the H&M organic line. 4. 4Moms mamaRoo⎹ I did a lot of research before deciding to splurge on this. When our son was two weeks old and we had had enough of not having one proper meal, we finally caved and got it. So so worth it! He chills, naps, plays in it. To be fair, this is the only swing I have tried, and I am sure you could find a less pricey option, but this one is definitely worth the hype. 5. Lamaze toys⎹ Not many things can captivate the attention of a newborn for more than 35 seconds. These toys are it. I found them utterly ugly at first, but babies love them. I will say though, one or two is enough! 6. Solly Baby Wrap⎹ Babies love being held. This will give your back a much-needed break. It is lightweight, easy to use and to bring anywhere. 7. A baby tub with an insert⎹ It does not have to be fancy, but something to prop your baby up during bath time is an absolute necessity in my book. Each baby is different and our priorities as parents differ from one family to another. You can easily find alternatives to all of these goodies for your own little one. These are just what worked for us. I hope this helps some of you parents-to-be! FX will loooooove this Solly Baby Wrap, he can't wait to use a baby carrier ;) Thanks for mentioning the onesises that open in the front... it's good to think about it!